AOL is a very different company now. It is independent again. And its mission is to redefine journalism for the Internet age. Seed is different because AOL is different. With such a large staff of professional journalists working with Seed and some very sophisticated news-gathering technology, our sites offer readers a level of quality and breadth that others simply can’t match. And that means the experience of working for Seed is very different as well. Your work will appear right next to articles written by Pulitzer Prize winners and other journalists at the top of their game on sites seen daily by millions of people. And we’re not just asking you to write from home in your pajamas. We’re inviting you, if you’re interested, to pick up your reporters’ notebook and join us in our front row seats watching the most interesting events in our world. That may be where Hansell wants to take Seed, which is still in beta and being kluged together on the back-end, but it’s definitely not where it is today. Seed, at least right now, looks more like Aol’s answer to Demand Media or Helium, where the going rate for an SEO-friendly how-to article seems to be in the $25 to $50 range. 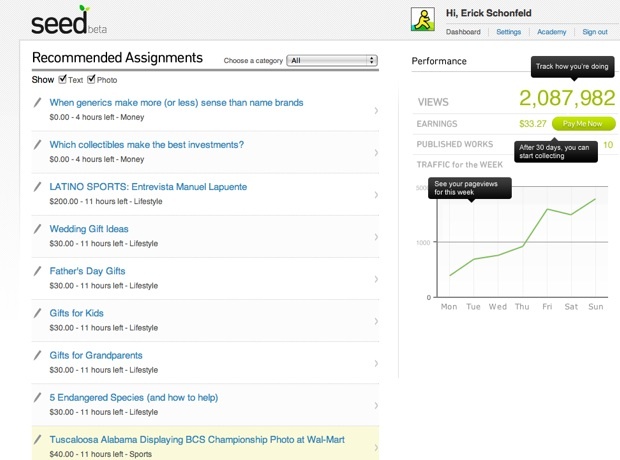 What are some of the current assignments on Seed ready to redefine journalism? I signed up for Seed to take a look around. The first thing I saw is that Aol seems to want someone to write a lot of gift guides (for weddings, Father’s Day, Valentine’s Day, kids, grandparents, teachers, and groomsmen). 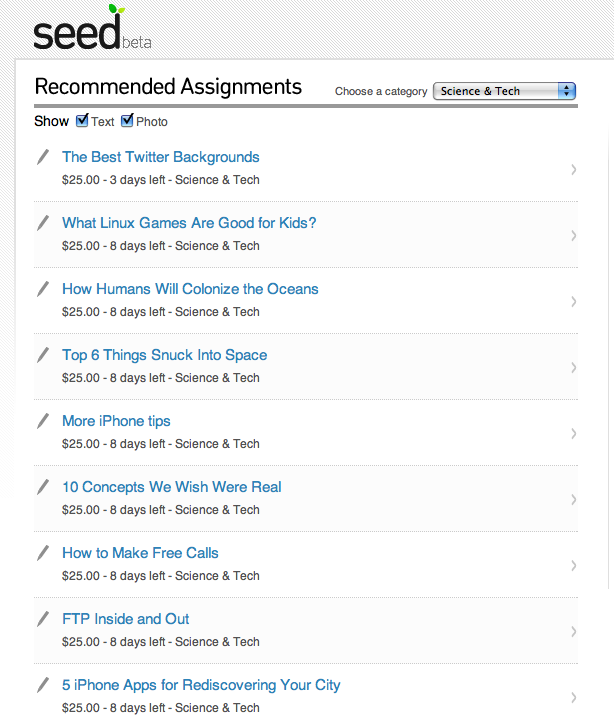 Then I went to the science and tech assignments. Seed is offering $25 for articles on the “Best Twitter Backgrounds,” “How Humans Will Colonize The Oceans” ($25), “10 Concepts We Think Were Real,” and “How To Make Free Calls.” (See screenshots below). The closest assignments I could find that might require some actual reporting are “What it’s like working at Target” ($25) and “How to Untangle Matted Hair on a Cat” ($80), which asks for an interview with a pet groomer. I am going to go out on a limb here and say that none of these are going to win a Pulitzer. But maybe that’s not what Aol means by redefining journalism. Hansell admits that what he writes in the post is highly aspirational, but he also cautions against judging Seed too early. “If journalism has to evolve at the pace of technology companies, we have to experiment in public,” he tells me. “We will do a lot of experiments. The potential of Seed is to tap into human intelligence at scale.” It is clear that Aol wants to use Seed to extend its reporting beyond the how-to variety.. Not that there’s anything wrong with teaching people how to untangle cat hair.